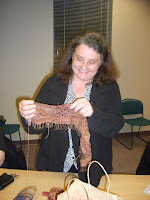 At our last knitting guild meeting, Catherine provided a wonderful presentation on knitting with beads. 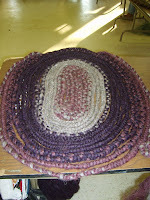 I have knitted with beads a couple of times and have tried two different methods. Catherine presented 4 methods and discussed some of the the pros and cons of these methods. 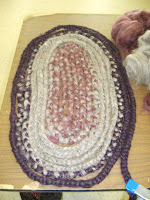 I was thrilled to add two more methods of knitting with beads to me skillset! 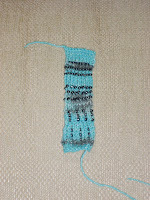 Knitting the bead into the stitch - Knitting with a pre-strung bead - making sure the bead is in front. 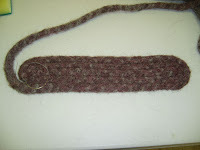 The bead will "float around" if not locked into place, so on the purl side, you need to purl through the back loop in order to "lock" the bead in place. This is the technique that gave me the most problems....I had to manually re-align my beads once I was done. Slipping the bead on top of the stitch - Knit 1, move the the yarn with a pre-strung bead to the front, slip one stitch, then knit as usual. This method is quite fast, but you can't put a bead on every stitch, so the beading is somewhat spread apart. Slipping the bead between stitches. This provides a very subtle beaded look where the beads "peek" out from between the stitches. Catherine pre-strung beads onto thread so we could just "tie it" to our yarn and load our yarn with beads....rather than stringing them one-by-one. Many thanks to Catherine for doing all that work in preparation for the tutorial - We all got a chance to try our hand at knitting with beads without the delay and aggravation of stringing the beads! Reversible cables? Yes! 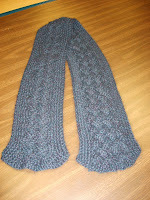 It's possible to have a cabled scarf that's beautiful on BOTH sides! 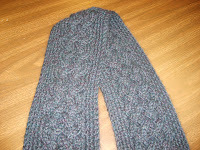 Anita brought in a scarf she'd made for her DH that has a lovely cable design that's beautiful and cabled on BOTH sides! She used the cable pattern fron "A Cardigan for Arwen" and added some seed stitches on the sides to frame it. Isn't it gorgeous? 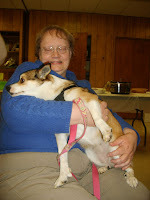 At the last Sons of Norway meeting, some of our members presented a slide show and talk on the Norwegian Lindehunds (One of the members is shown here holding her Lindehund). 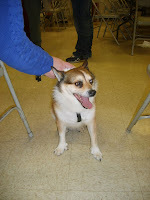 Several Lindehunds were also brought in from display. The Lindehund (also called the Puffin dog) is a very rare breed that was almost extinct. They were being killed off as a threat to the puffins....however, it turned out that the Lindehund was actually the endangered animal, not the puffin! The Lindehund has developed some unique features that made them a perfect fit their environment and prey. They developed additional toes - a minimum of six! They also have unusual joints where they're able to turn their heads around and lay them on their backs and walk backwards into tight spots in caves. When they run, their legs go out to the side and look similar to the arms of a racing swimmer. 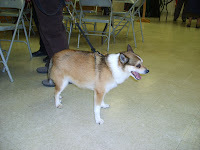 The Lindehund page can provide you with some additional information on this unique breed. At the meeting, I started another pair of socks. This time, I'm using Fortissima Socka Color with some metallic silver threads throughout. Since it's still winter around here, I thought that it would be fun to have socks that "glisten" with the look of ice crystals. I don't have a picture to share as I didn't get very far during the meeting - I was too distracted by the Lindehunds! Just before the meeting, I finally completed the January and the February Block of the Month (Ravelry Monthly Adventures group). The January block is the double moss and the February is the heart. 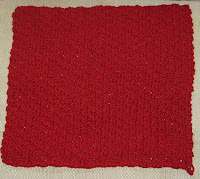 Both squares are unblocked and I left some yarn on the edges so I could sew the blocks together when I'm done. I'm planning to make a Project Linus blanket from the squares I make with this knit along. I do need to tear out and re-knit the January block because it's a bit larger than the planned 12x12. I used a size 8 needle for the January block and went down to a 7 for the February. 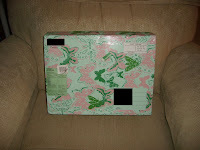 I received a fabulous package as my last one for SP13. My spoiler was Hanna...from Finland. She did a wonderful job selecting the perfect items for me. I am absolutely amazed - though we've never met, she seemed to know me so well! Inside, was a treasure trove of goodies in addition to a lovely letter introducing herself. 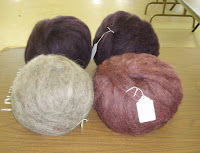 There was an abundance of lovely yarns - including some special hand-dyed yarn! The colors of all of them are perfect - I just love them all. Wow. I'm speechless! Oh...did you notice the really cool towel? It's a Muumimamma towel - and there's some wonderful soap with it too! The package was chock full of all kinds of treats to keep me going as well. After all, one does not live by yarn alone, right? There's some coffee, scandinavian licorice (with a bit of salt), some candy bars, black currants (yum!) and chocolate covered lingonberries (double yum!). 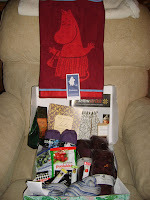 This was the PERFECT mix of treats to send to someone of Scandinavian descent! The last two items are absolute treasures. Two booklets of fabulous Fair Isle designs - including recent reprints of patterns from the 30's and 40's. I keep flipping through them trying to decide which one to do first! In the one booklet, it looks like it gives instructions for booties, socks, stockings, caps, and scarves where I can mix and match all types of fabulous color work! I think I'll be spending a lot of time with these pattern books over the next several months! You definitely need to check out Hanna's blog (link on the right). She's an avid sock knitter and has some absolutely fabulous projects. Thanks so much for the fabulous package Hanna! I finished braiding my rug at home. Just before braiding the final row of purple, I decided to "lay out" my rug on the bed...just to get an idea of how the finished rug would look. I LOVE IT! I can't wait to finish it! 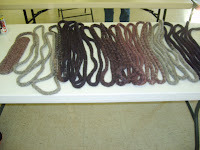 Once the rug was braided, I had to felt it in preparation for the sewing step which we were taught in the Feb. 8 class. I ran it through the agitation cycle twice. The first time through, I had very little felting. The second time through, I got the expected amount of felting. After felting, I tugged a bit to straighten the braid and used the felting needle to push in any loose bits from where I'd joined fibers. 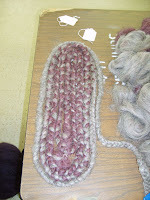 The first step in preparing to sew is to lay out the entire braid on the table. You then determine which side is the right side and try to lay all the braids flat. 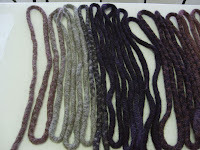 I think I preferred the definition of the colors that I got before felting over the felted results. 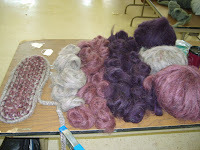 The felting process blended the colors a bit and made them less distinct. 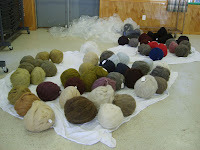 However, the felting will definitely make the rug more durable. I think that with the next rug, I may not braid it as tightly...and then I should be able to see the braid more distinctly. The next thing we did was learn how to sew the braids together to make the final rug. You insert the needle from the center of one braid, through the middle to the center of the braid next to it. I found that it was much easier to use the curved needle rather than the straight needle. I was sewing rather close together, so it will take me forever to sew the rug together. We've decided that I should sew it more in a "w" shape as the such tight sewing isn't really needed. Since my braids are rather tight, I had a very long braid and as a result, I had a LOT of sewing to do! It seems like I barely made any progress before the class ended. I'm not sure how quickly I'll get the rug sewn together, but I'll definitely post a picture of the final result when it's done. 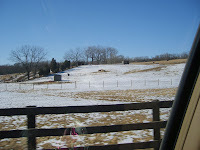 The ride out to Leesburg for the class was beautiful! It had snowed earlier in the week, but the temps on Sunday were supposed to get into the 60's! I managed to capture this "horse-scape" just outside the fair grounds. It was all melted by the time I left for the afternoon. 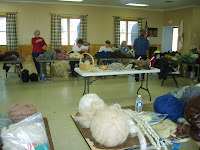 The Feb 1 class was spent in fiber preparation and braiding. The instructors supplied us with a fabulous kit that included a clamp for braiding, some clothes pins, a needle for sewing the rug together, a sponge with a felting needle, a measuring tape, a large laundry bag for washing/felting my braid, and some waxed linen thread. Once I selected the colors for my rug (shown in my last post), I was ready for the next step. 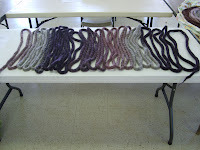 I created little bundles of doubled roving in 12-18" lengths and laid them out on the table. Next, I started braiding and adding color combos as I went along. I braided much more tightly than some others, so my rug will have smaller braids once it's complete and will be a more dense rug. The density should make it wear like iron! These photos show my progress with just the center portion of the rug braided. We all had a lot of fun chatting while we worked on our braids - there were about 20 of us in the class. Braiding produced lots of little hairs and fibers making quite a mess! The stray bits of fiber were gathered up and can be felted into a ball to make a pin cushion or cat toy - waste not, want not! A full room and fun group! 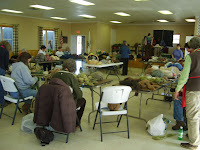 About half of us finished braiding during the class and were able to leave the braids with the instructors for felting. I didn't finish braiding during class, but I did make some great progress! I took my roving home to finish braiding. After that, all I needed to do in preparation for the next class was to felt my braid. I really enjoyed watching how the colors I chose "blossomed" into a gorgeous rug! This post is a bit overdue, but I've been so busy I haven't had the time to properly document my rug adventure. At Maryland Sheep and Wool last summer, I purchased a copy of the book, "The Shepherd's Rug" and managed to get one of the authors to sign it while I was there. I loved the braided rugs they had on display and desperately wanted to make one for myself. We had a nice discussion on what colors/types of wool to use for the rug and I set off with a whole list of potential wools in my head. In the Main Hall, I'd found a vendor with lots of lovely Navajo Churro in a nice variety of natural colors - PERFECT for my project. I then bought about 4 lbs of lovely natural colored Navajo Churro roving for making my rug. The poor roving has then languished in my craft room for the several months. 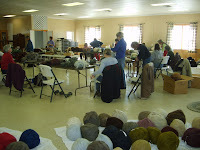 Then, this past fall, my friend Catherine took the rug braiding class in Rhinebeck at the NY Sheep and Wool show. 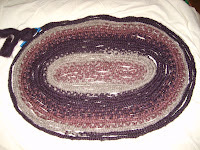 I fell in love with braided rugs once again after seeing her lovely creation! This caused me to move my roving to the "front of the project line". However, life intervened once more and the roving again was languishing in my craft room. 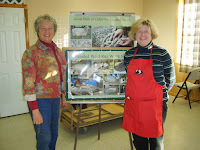 In January, I got an e-mail from a friend letting me know about the Loudoun Valley Sheep Producers Association and some local shepherdesses that were planning to hold a class on making braided rugs. I scurried to sign up and set off to class on Feb 1....the first of a two part series. Happy, happy, joy, joy! My roving will FINALLY be used! 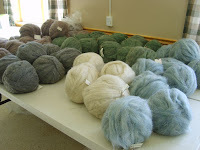 DH was thrilled that I was going to be using some of my existing stash....rather than acquiring more...and we even discussed the fact that I'd have "no business" buying more roving. With great anticipation, I loaded my 4 lbs. of Navajo Churro in the car and set off to Leesburg for the class. When I arrived, I decided to leave the roving in the car and "just take a peek" at the rovings that the two instructors (Sue and Kathy) were bringing. 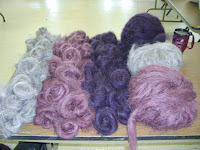 Well, much to my surprise, there was not only natural colored roving, but also some fabulous colored rovings! And they even had PURPLE!!!! Can you believe it? 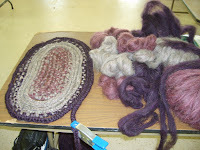 I can make a PURPLE rug! How cool is that? Above is a shot of the remaining colors....once we'd all made our selections. We all seemed to gravitate to the more saturated colors to blend in with the greys and naturals. My response was simply, "Who knew that they'd have purple. Purple! Can you believe it?" He's a great hubby and fully understood my decision to buy the roving, so all is fine. He's DEFINITELY a keeper! Today is Valentine's Day....one of the "holidays" that I just love! It's such a happy time...full of bright colors, pretty hearts and perhaps some chocolate and roses. 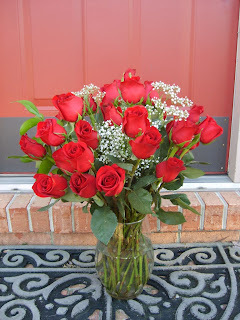 Once again, DH was over the top with a fabulous bouquet of roses. They are so fragant! I just love them. Pardon the arrangement of the roses...I'm not the best "floral arranger", but I tried. I think I need to go to remedial "florist school" - LOL! I also got a cool "Hoops and Yoyo" talking travel mug - I LOVE Hoops and Yoyo! Finally, we had a fabulous dinner at "The Blue Iguana" where I had the most incredible Seafood Linguine - lobster, crab, and scallops in a creamy lobster sauce.....mmmmmm! I was definitely a very spoiled sweetheart! But that's not all. For the past two years, Valentine's Day has also meant some wonderful "knitty goodness" as well! 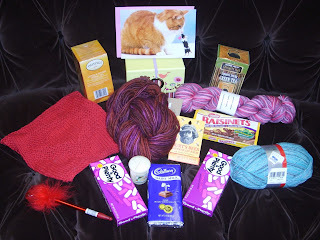 On Ravelry, there's a group of us that do an exchange of yarn and goodies that we all open on Valentine's Day. This year, Suzie absolutely spoiled me with a fantastic box chock full of goodies. She even included Good and Plenties and Raisinets...both of which are a personal favorite! 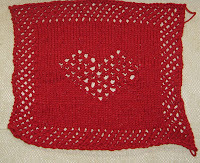 AND...she knitted me a face cloth with a cute heart design on it - I feel so special! The yarns she included are "to die for" - luscious Manos (deep, rich colors), yummy Chewy Spaghetti (vibrant and cheerful "Valentiney" colors) , and a gorgeous Fortissima Colori Socka Color sock yarn in a gorgeous turquoise with silver threads through it. The yarn glistens like it has little ice crystals resting on it - so cool! My next pair of socks will be a "sparkling pair" from this yarn! Although I haven't posted much, I have been rather busy and have finished a few things over the past couple of weeks. I've FINALLY felted the two bags that have been languishing in the "to-do" pile since late summer/early fall. Once shouldn't rush these things you know...LOL! 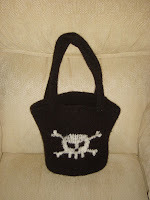 The Skully bag felted down to a bag that's about 9 inches wide and 11 inches tall on the sides. 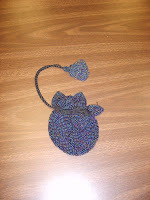 It "bows up" a bit toward the center of the bag to be about 13 inches tall in the center. I believe it's a consequence of the method I used for the color work. I used the Fair Isle method where I carried both colors of yarn across the design and twisted the yarn every 2 or 3 stitches. I believe the pattern recommended intarsia. I kind of like the way it "curves" to the middle and am quite pleased with the results. 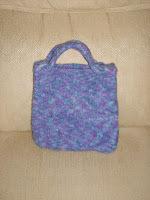 The multi-colored bag felted down to a rather small bag. I strung the handles through and grafted them together. The bags design is somewhat similar to the Booga Bag in construction. 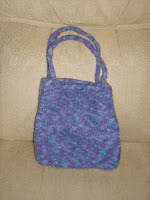 The handles are such that I can cinch them up to create short handles or a bit longer for use as a shoulder bag. My final accomplishment was finishing the Lorna's Laces socks. I love them! The yarn is so wonderfully soft and the colors so vibrant! I did mess up one of the decreases on the first sock, so I had to frog it all the way back to the beginning of the first decrease row. The other issue with the sock is that the very top of the toe on the first sock is purple....and on the second sock, it's turquoise. I prefer a pretty much exact match on my socks, so I find it a bit annoying. I guess that since the tiny little tips of the toes will be hidden, it's not such a big deal. Sigh.